An Australian seller of Wii, PlayStation 2 and Xbox 360 modchips has posted video showing the famously impregnable PlayStation 3 running "back-up" copies of disc games saved in the hacked console. It's the real deal, they tell Kotaku. OzModChips.com has posted three videos to YouTube showing the alleged hack, marketed as PS Jailbreak, which purportedly is executed by plugging a $170 (Australian) USB stick into the PlayStation 3. The legality of console modchips differ by region. They are not legal in the U.S. Such a hack would enable PS3 users to run back-up copies of games, homebrew and, of course, pirated games, something which Sony has long successfully blocked on its home console. Kotaku has reached out to PlayStation's U.S. division for comment about this alleged hack and will update this story with anything we hear back. The narrator of the first video says the modchip arrived at their office in Australia this morning, August 19. A follow-up video shows what appears to be a PS3 that has its disc drive occupied with a copy of the game Uncharted while it runs a saved version of Ratchet & Clank: Tools of Destruction. This is proof, the site maintains, that their new "PS Jailbreak" product will work. With the hack working, PS3 users would not need to possess a disc copy of a PS3 game to run it, a potential piracy nightmare for Sony. Kotaku has no access to the USB stick and can't verify whether the stick works. But we have been talking to a representative of OzModChips.com who tells us that the stick "is not a hoax." The rep, who would not provide his name and asked to be called "Mr. OzModChips", pointed Kotaku to a new video that, unlike the Ratchet clip, shows a TV and PS3 in full view for the entirety of a demonstration of the hack. The video was made to quiet skeptics who think that today's original clips were not proof of a working hack but simply hype and video editing trickery. Some skeptics have said that the videos show the hack running on a debug PS3, but Mr. OzModChips tells Kotaku he is using a retail system. Mr. OzModChips told Kotaku that the chip stock originates from China or Hong Kong but declined to say who designed the chip or where they are based. His site reports that "apparently 150 games have been tested on" the chip, which he tells us is information gleaned from direct contact with the chip maker. As for how this hack works, given that Sony's machine has been essentially uncrackable for four years, he told us in an e-mail: "I think it tricks the ps3 into thinking its a dev unit, but I don't know to much technical info about it." The OzModChips website indicates that this chip will be available by the end of the month and works with PlayStation 3s that run firmware 3.41, the current firmware for the console. It is possible that a future Sony firmware update could seal any cracks a modchip exploits in the machine. Sony's PS3 has long been secure from modchips which are seen as a pathway to piracy. The PlayStation Portable, however, was cracked early in its existence. For several years, Sony and hackers have engaged in a war of firmware updates and new hacks: Sony regularly issues new PSP crack-sealing firmware that gamers are required to install in order to play new PSP games; hackers respond with new software exploits that re-open the device to backup copies, homebrew software and pirated games. The Xbox 360 and Wii have been cracked for years, and publishers and developers alike complain that some owners of those consoles can and do run pirated copies of disc games on the machines illegally. Some suppliers of console, such as OzModChips, publicly state that their services are intended only for legal backing-up of games and running homebrewed software. 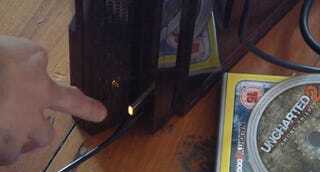 Mr. OzModChips said that this PS3 hack USB device has been sent to other modchip sellers and that we can expect more video to be popping up about it online.